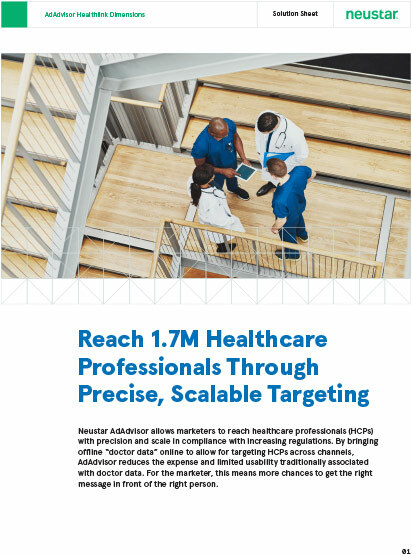 Neustar AdAdvisor allows marketers to reach healthcare professionals (HCPs) with precision and scale in compliance with increasing regulations. By bringing offline “doctor data” online to allow for targeting HCPs across channels, AdAdvisor reduces the expense and limited usability traditionally associated with doctor data. For the marketer, this means more chances to get the right message in front of the right person. Neustar has a unique identity methodology linking the industry’s largest repository of authoritative fractional identifiers to online cookies and mobile devices for 220M adults. With AdAdvisor, marketers can reach over 120 million US households across all channels. That means once you build an audience, you can target against it in a consistent way across web, mobile, social media, direct mail, and addressable TV. Where Is This Audience Data Available? Syndicate anywhere on a custom basis with a 2-week turnaround for defining the target, pricing the target, building and syndicating to the target platform. AdAdvisor taxonomy organizes healthcare professional by 1st and 2nd specialty. Filter and search by one or both.